What is ‘evil’? What are the ways of overcoming this destructive and morally recalcitrant phenomenon? To what extent is the use of punitive violence tenable? 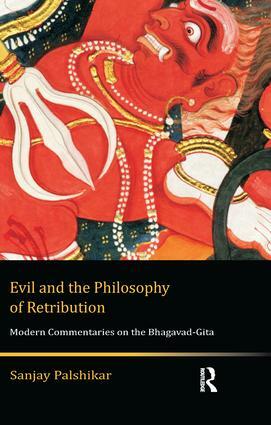 Evil and the Philosophy of Retribution compares the responses of three modern Indian commentators on the Bhagavad-Gita — Aurobindo Ghose, Bal Gangadhar Tilak and Mahatma Gandhi. The book reveals that some of the central themes in the Bhagavad-Gita were transformed by these intellectuals into categories of modern socio-political thought by reclaiming them from pre-modern debates on ritual and renunciation. Based on canonical texts, this work presents a fascinating account of how the relationship between ‘good’, ‘evil’ and retribution is construed against the backdrop of militant nationalism and the development of modern Hinduism. Amid competing constructions of Indian tradition as well as contemporary concerns, it traces the emerging representations of modern Hindu self-consciousness under colonialism, and its very understanding of evil surrounding a textual ethos. Replete with Sanskrit, English, Marathi, and Gujarati sources, this will especially interest scholars of modern Indian history, philosophy, political science, history of religion, and those interested in the Bhagavad-Gita. Sanjay Palshikar is Professor at the Department of Political Science, University of Hyderabad.